Here is a poignant scene. Reunions are an important trope in all stories, because they’re an important element in all of our lives. As Mormonism’s grand cosmological narrative makes clear, our very life is about separation from our parents and working toward an eventual reunion—after we’ve made our (usually very messy) journey and acted in faith to do the things that we’ve been commanded to do. Verse one gives us a nice twist, however. It’s not that the brothers have completed their quest and come home like every other Odysseus. Rather, they’ve completed their quest and having done so returned to the wilderness. The Book of Mormon is indeed, as Jacob who was born in the wilderness will later state, a story of strangers wandering in the wilderness. Grant Hardy offers a compelling argument that this scene is a matter of artful obfuscation. Nephi distracts his readers from his murder and what was surely an awkward reunion—one can almost hear the irony, imagining Nephi declaring that he has accomplished the commandments of the Lord—by throwing his poor mother under the bus and making the reunion about her own struggles and faithful reconciliation. It’s also hard not to see this as adding insult to injury, given that this is the one time Nephi focuses on a woman’s experience or quotes her (one of three named women). While I agree that Sariah’s experience is being exploited here, I see it as political exploitation—and it’s of course impossible to know how willing she might have been in this regard (i.e., while Nephi’s certainly making use of her experience, exploitation might be the wrong word). Imagining competing narratives of the events and meanings of the Lehite exodus, it’s hard to imagine Sariah’s struggles not playing a role. It’s certainly conceivable that there’s good reason Nephi never again quotes his mother. Here Nephi uses her experience as another evidence of his overall position: yes, it’s hard to see, and yes, it’s a struggle, but God is the one behind the exodus, and it succeeded to the degree we were faithful to God’s commands. If Sariah’s struggles were as significant as this tiny glimpse makes them appear, then her reconciliation and testimony of Nephi’s narrative at this point is powerful indeed. While I think Hardy makes a compelling case for how this scene literarily distracts the reader from the murder, I imagine it playing a slightly different role for a later Nephite audience already familiar with an “anti-Nephi” narrative that undoubtedly focused in on the murder. 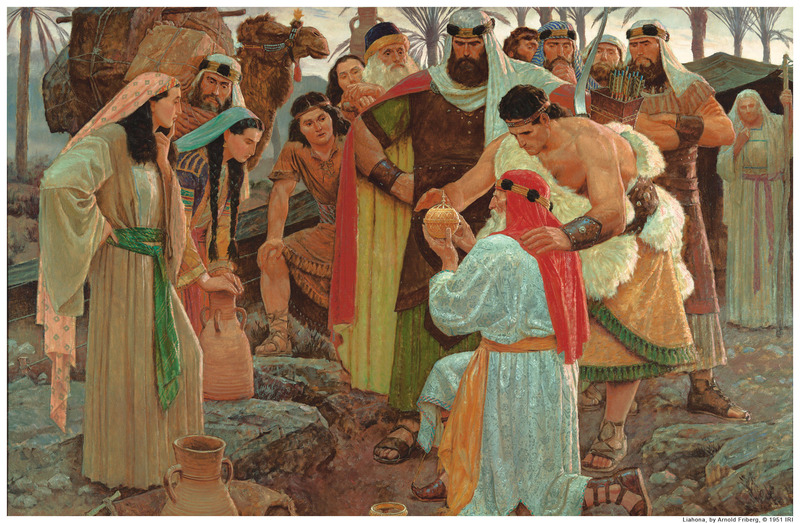 Sariah’s experience and testimony corroborate Nephi’s overall account that begins with his pre-return conversation with Lehi. The murder is solidly wrapped in a faithful discourse—Nephi promises to do as God commands; Nephi obtains the plates; and given the literary placement of Sariah’s testimony, the murder ultimately becomes not only God’s design, but also evidence of God’s purposes being fulfilled in Nephi’s actions. What stands out most in this passage, however, is the tension between Lehi and Sariah. How are we to accomplish this Herculean task of becoming one flesh? We cannot but be two humans, which means we cannot be without two sets of experiences and worldviews. And God—at least in the scriptural stories—is absolutely partial. Where is Sariah’s pillar of fire on a rock? Where are her visions? Why is Lehi the one who’s given certainty about this crazy, perilous quest to regain the plates from a man whose character they undoubtedly knew in advance? Acknowledging Lehi’s prophetic role, is certainty so precious a good that it couldn’t also be shared with Sariah? I do not understand the contrast between an Emma and a Mary Whitmer, and even less the trial for Sariah. If we assume that God understood their educational needs and provided accordingly, than we admit that we’re capable of being made to understand. My wrestling hasn’t yet brought me a plausible reason. I’ll confess, it is Sariah’s experience that I find it easier to relate to, though I occasionally find myself dumbfounded in Lehi’s shoes as well (“Yes, I’m a visionary man, isn’t that a blessing?”). What allows her to sit back and permit Lehi to send off her sons? The easy answer is of course a rigidly chauvinistic culture, but let’s bracket that (especially since, not knowing more of Sariah and Lehi and their interactions, it’s hard to know how relevant that element was). I see a faithful woman—without knowledge—willing to wait on the Lord, but candid rather than cavalierly blustering about what faith and waiting entails. Here Sariah gives us the testimony that our family relationships are ultimately what matters, that there is no grand prize that we obtain that makes up for failure on the familial end. What comfort would brass plates be if either Laman or Nephi returned home dead? Would there be even that small consolation of plates? Or would they all perish in absolute vanity? In the wake of mortal uncertainty—an uncertainty guaranteed to endure to the end—how do we unite with our spouse on crucial issues when we begin in diametrically opposed positions, and when the stakes are existential? This is the question that rivets my reading of this passage. Here also, Sariah gives us that prodigious transformation from waiting on the Lord without knowledge, to faithfully seeing in the return of her sons the hand of God and the expunging of her doubt. We all have similar experiences of triumph; my own triumphs tend to haunt me as much as they do ground me. I can’t always make this transformation. And when I do, it doesn’t always last through eight years of brutality in the wilderness. A few months of genuine hardship are enough shake me to the core. I can only hope that I can obtain and be what Sariah was. Back in 1998 in an essay in RBBM 10/2, I used Robert Alter’s notion of type scenes to suggest that the reason that Nephi includes the “complaint” story about Sariah is that it allows him to make an allusive comparison between his mother and the story of the widow and Elijah. The comparison shows that he wants his readers to view his mother an exemplary woman of faith, as was the widow. Both sacrificed all they had for their faith, and in subsequent dire circumstances complained to a prophet, and were blessed with the restoration of their sons. Well, your whole view is overshadowed by your belief that Nephi murdered Laban and Nephi must trick his audience into justification for his act. Im just wondering if your entire dialogue of the Book of Mormon is goung to be overshadowed by this supposed “murder” you believe Nephi committed? Kevin, do you have a link? I’ve never heard this connection and would very interested to read about it. Rob, I fear that your whole view of this series is overshadowed by your belief that my reading is heretical. I’m wondering if your entire dialogue on this series is going to be so overshadowed, or if you’ll ever be able to comment on the substance of what I write. Kevin, someone in one of James earlier posts made a point I’d not considered. Given the rarity of the scriptures, how many of these stories would Nephi have been exposed to? I’m all about type settings and clearly Nephi’s exposed to some. At a minimum the Exodus and Joseph of Egypt narratives. He also seems very taken with Isaiah although it’s hard to know when this happens. Of course Nephi is writing decades later when he does have scriptures and thus some version of these stories so maybe this isn’t much of an issue. James, I’m not at all clear why it would be an awkward reunion. I think you’re guilty here of reading too much 21st American century context into the story. In a world of constant violence in what was effectively a war zone, why do you think they’d react like that. To draw an analogy, think of combat zones in Afghanistan. Do you think they’d have the reaction you outline? I don’t see Nephi throwing his mother under the bus. I’m *sure* their mother would complain if she thought all her sons had just died. Also note the word choice in verse 6. It’s “comfort” rather than some variant on “berate.” I think Nephi’s trying to explain his mother’s feelings. Clark, I think you answered your own question, given the that Nephi provides a reminiscence rather than a diary entry. Plus, I expect that even given the relative scarcity of personal scrolls, an oral culture provides other means for letting the stories told. I remember hearing about Daniel in the Lions Den, for instance, before I could read. And I have heard suggestions from people who have read up on scribal traditions in Jerusalem, that their comparisons make it plausible that Nephi had undergone scribal training in Jerusalem. Clark: you mistook my gloss on Hardy’s reading for my own articulation of the scene — though I think the obfuscation case compelling. I’m not sure if picturing Afghanistan’s helpful or not; while clearly not 21st century America, we have no idea how exposed or desensitized to violence they were personally. Regardless, I can’t see Lehi and Sariah being human (let alone faithful) and the scene not being at least awkward — sans any contemporary projection. They send Nephi and their other sons to fulfill the commandment of God and fetch the records, clearly hoping that the Lord would deliver them home safe. This indeed happens, but it turns out that their most faithful son killed the unconscious Laban in order to accomplish the task. Lehi and Sariah don’t need to have had my reaction in order for this to be awkward (in fact, awkward’s not how I would describe it should my son return from his mission having intentionally killed someone — even an enemy of the family). As I said, they don’t bundle him up and head back to Jerusalem to stand trial; but surely the facts at least brought them up short, even if it didn’t ultimately disrupt things. I think that our determination to lionize Nephi together with our millennia removal from the events often tends to cover over our ability to see the genuine difficulties. I definitely agree that this is a conversion — and as noted, I suspect Nephi’s making full use of that conversion, just as we make use of conversions today, but with a political twist. Kevin, yes and no. Yes in that this is Nephi writing decades later. No in that if he’s giving a somewhat accurate account of events and his thinking then that isn’t sufficient. Whether he actually is doing this is of course a point of debate. So to go back to past days debates here. Is Nephi aware of these rules about Laban and the scriptures people have brought up about Exodus at the time? Or is this just a later Nephi using that knowledge to justify past acts? Of course even if Nephi didn’t have scriptures that doesn’t mean the stories weren’t told orally or the scriptures read publicly at times. James, the account of the invasions suggests a lot of violence. The Northern Kingdom is gone. Jerusalem has already been conquered, troops sacking the temple, and a new King put in place just a few years earlier. I’d be hard pressed to see how they wouldn’t be experienced in that sort of violence. The ancient world seems like an oppressive violent place. I just think we’re reading too much through a modern lens. There’s no sense the Jews at this time are pacifists. Rather we seem put in the middle of a very tense time of invasions, conquests and war. If Lehi is a trader then he has a career with the constant threat of violence from robbers or worse. I’m fine asking these hard questions. But again we have to ask them from the place Nephi grew up. I dont see Nephis return as awkward. I see it as a great rejoicing. The slaying of Laban- an added bonus and faith securing measure had by all. Clark – I agree generally speaking, even if I suspect you’re over emphasizing the commonplace nature of violence. I hope I’ve been clear throughout that I don’t think Lehi & Sariah would’ve had my reaction. That said, I do think that we ought not to valorize Nephi’s approach here, even if (once again) we don’t have my reaction. But again, this isn’t my main point. In fact, my main point isn’t even Nephi’s use of Sariah’s experience to further the faithful political narrative (God commands, Nephi & Lehi answer the call, Laman & Lemuel despite miracles struggle [i.e., their whole approach and narrative is discredited], Sariah serves as hard-headed realist and yet has this glorious conversion –> Nephi’s solid theocratic political narrative overcomes the anti-Nephi political narrative taking place in the new world), though that is unquestionably one of the things that stood out to me this time through. My main point is that Sariah’s conversion offers us a model of waiting on the Lord in the midst of uncertainty (and empirical reasons to doubt), which is then transformed into an ability to see and experience God’s hand. This strikes me as both a more plausible and a more fruitful way to read her role in this passage than the common reading: faithless wife doubts prophet husband, but in the end see’s he was right and so is comforted. Yes, I think faith in the sense of showing reliability is key to Nephi’s narrative. This is a fairly Hebrew way of conceiving of things. (My posts on truth as the reliability of objects fits in here) I think Nephi is very concerned about establishing the reliability of Lehi in all this. Perhaps because at the time he’s writing in the new world the land of promise perhaps seems much less of a land of promise than it did in Palestine. (Think Jacob’s rather depressing lament in Jacob 7:26) Of course the question then becomes who Nephi’s audience is in these plates. As a woman, I appreciate this sentiment, James. I have often felt Sariah is mis-represented, and not even necessarily by Nephi, just by the way we tend to read it today – i.e. Lehi must have married a nagging woman, just like so many other poor men in the world. She really should have just trusted in prophet of the Lord, duh. In reality, I think she showed a whole lot of faith. I also appreciate your bringing up Emma. I think there are a lot of similarities between the two women. Both married to prophets whom they love and trust, but who also do things their wives are less inclined to just readily go along with. For years in our church we sort of pretended like Emma didn’t exist and she was villainized for having stayed in Nauvoo and not following Brigham Young. Still today there’s just not enough talk about her or research done on her or publications about her. I’m afraid in the far future people will say the same things about the women tied to our prominent church leaders that we say about the women in the scriptures. Where are they? What did the wives and daughters and sisters have to say about their prophet husbands and fathers and brothers who they knew better than anyone, “warts and all,” and yet still loved, trusted and defended. Emma Smith means a lot to me and my faith, as do the women in the scriptures. I….rejoice is the word that comes to mind….rejoice when people (men particularly) take time to really focus on them, especially turning something often seen as negative into a positive. So thank you. I think the villianization of Emma was for a bit more than just not going west. I suspect part of the reason for not dealing with her publicly (except via misleading hagiography type presentations) is because of those complexities. But I agree she is demonized or ignored too much. I doubt most of us would have been able to handle what she went through. I think women like Zina Huntington or Eliza R. Snow are a bit more faithful although again their histories might be too complex to present is a simple way. The treatment (usually neglect) of women in the Book of Mormon is troubling. I’m sure we’ll get to more of that in the future. For what it’s worth, here’s a 2005 version of my Type-Scene approach to Sariah’s complaint. It goes a bit more in to the comparison with the story of Elijah and the widow. Clark, I think faith is something very hard to quantify. And there are many different types of faith, so saying one woman has more faith than another seems like a poor way to measure the women in our past. Additionally, just because women like Zina Huntington and Eliza R Snow were better able to cope with polygamy or yet another exodus does not equate greater faith. I think Emma had a very unique set of circumstances to deal with. I do agree that I cannot imagine anyone having done a better job and these women’s histories are more complex than we are able to judge rightly. Well, I’m not sure they were better able to cope. I think if you read about them you see huge struggles and massive things were asked of them that most of us will never have to deal with. While we don’t know what was in their hearts and we can’t judge them in that sense, we can see how they dealt with adversity. Again with Emma, I don’t know her heart, but it seems clear she didn’t deal with it as well. Why that is I don’t know which is why I’d never consider judging her. That’s up to God. I just know that for a role model in the gospel it’s hard to find a stronger person that Zina Hungtinton and that includes most figures in the scriptures I’ve read.